Millions of people around the world are working hard to bring to life new ideas. Some of these ideas will turn out to be stunning successes that will have a major impact on our world and our culture: the next Google, the next Polio vaccine, the next Harry Potter, the next Red Cross, the next Ford Mustang. Others will be smaller, more personal but no less meaningful, successes: a little restaurant that becomes a neighborhood favorite, a biography that does not make the best-seller list but tells an important story, a local nonprofit to care for abandoned pets. At this very same moment, another group of people is working equally hard to develop new ideas that, when launched, will fail. Some of them will fail spectacularly and publicly: like New Coke, the movie John Carter, or the Ford Edsel. Others will be smaller, more private, but no less painful failures: a home-based business that never takes off, a children’s book that neither publishers nor children have any interest in, a charity for a cause about which too few people care enough. If you are currently working to develop a new idea, whether on your own or as part of a team, which group are you in? Most people believe they either are, or will be, in the first group - the group whose ideas will be successful. All they have to do is work hard and execute well. Unfortunately, we know that this cannot be the case. The law of market failure tells us that up to 90 percent of most new products, services, businesses, and initiatives will fail soon after they are launched - regardless of how promising they sound, how much we commit to them, or how well we execute them. This is a hard fact to accept. We believe other people fail because they don’t know what they are doing. Somehow, we believe this does not apply to us and to our idea - especially if we’ve experienced victories in the past. 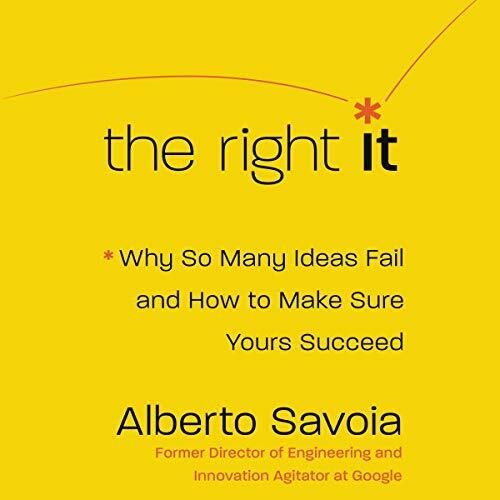 Filled with detailed case studies, a lesson on creating your own hard data, a strategy for market engagement, and an introduction to the concept of a pretotype (not a prototype), The Right It is a groundbreaking, entertaining, and highly practical audiobook that delivers a proven formula for turning ideas, products, services, and businesses into successful endeavors. While it’s not too late for our concept, it would have provided a scientific method of acquiring our “Your Own Data” (YODA). Since we’ve had a few false starts, I can now classify most of those as YODA. The author addresses the question but his solution to the problem is not clear, complicated and too long.